Gone are the days of artificial grass being solely used on hockey and football pitches. Now, manufacturing technology has evolved allowing for artificial grass to be used in a variety of ways. Initial artificial grass applications date back to the late sixties. Marketed under the name Astroturf, the artificial grass was primarily used on hockey pitches and tennis courts before being used on football pitches. The Astroturf name gained recognition when the famous Astrodome Baseball Stadium in Texas (USA) replaced their natural grass pitch with the so-called Astroturf. This first wave of artificial grass provided functionality, but it did not resemble natural grass in any shape or form. This was due to the artificial turf being composed of nylon, which essentially acted as a thick layer of carpet. Nylon caused many issues as players suffered from burns when their skin came in contact with the turf. In the 1980s, makers of artificial grass started using a composition of polypropylene and sand. The change of materials lowered the cost of the turf and the sand in-fill provided a more natural ‘bounce and roll’. However, the sand caused similar injuries to its nylon counterpart. The end of the nineties saw artificial turf developed for field contact sports. The overriding difference was that players could now make forceful contact without causing burning or grazing injuries. This was possible due to the artificial turf being made from polyethylene, and the sand in-fill being replaced with rubber granules or a mix of both. The polyethylene turf also provided longer fibres, making the artificial turf look a lot more like natural grass. This caused an expansion in artificial grass being used for landscaping, as it provided a low-maintenance solution to natural turf. Since 2008, non-infill artificial grass products have been introduced to the market. These new-age grasses were developed by Namgrass and set the global standard for artificial grass products. Namgrass consists of long pile height with different shaped yarns and fibres to add both support and stability to the grass. Using this mix of materials allows for the grass to remain upright—just like natural grass! 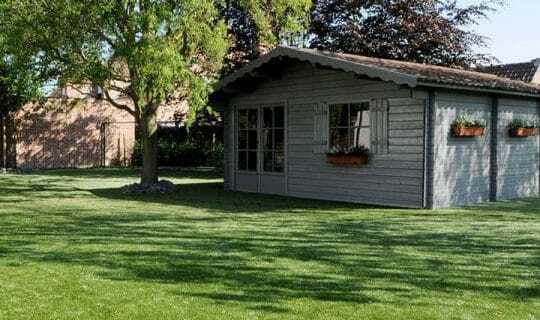 How is Artificial Grass Made Today? The raw materials (polyethylene and polypropylene) are mixed in a hopper machine, before colours and chemicals are applied to give the desired shade of green. This also provides the artificial grass with full UV protection. The liquid mixture is then placed through an extruder, where it is moulded into elongated strands to mimic that of natural grass. These now formed strands are put onto a carding machine and rotated into a loose rope. The loose rope is then woven into a tighter yarn, which is set through being heated. Large spools of yarn are then fed through a tufting machine. A tufting needle pierces the primary backing, which pushes the yarn through. This continuous process turns the yarn into a carpet of artificial grass. The new artificial grass is rolled under a latex dispenser, that spreads latex onto the underside of the turf. The underside surface is then heated to cure the latex. The artificial grass is fed through a machine that cuts any yarn that rises above the uniform surface. Finally, the artificial grass is rolled for delivery. Watch the full manufacturing process at our Ghent factory in Belgium here!